The time has come! The Food Charter launches today at the Food Access Summit in Duluth, Minnesota. Thousands of Minnesotans have come together in preparation for this exciting moment in history. 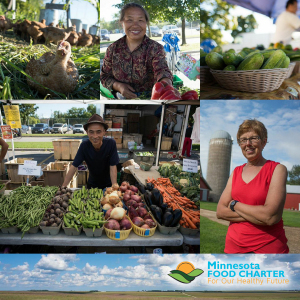 The Food Charter will serve as a roadmap to guide policymakers and community leaders in advancing access to affordable, safe, and healthy food for all Minnesotans. Thanks to all who’ve joined us on this journey thus far. Please Share, Act, or Learn. Explore the Food Charter now, watch the video, and join the conversation. Together, we can improve Minnesotans’ access to healthy foods!